The EX30 is the result of years of extensive engineering and design experience coming together with customer feedback to create one of the most powerful and user-friendly portable carpet extractors ever made. The EX30 is designed with the end users needs in mind. Features like upright, dolly design for easy loading, unloading and stair climbing make the EX30 easy to handle by one person. Wand caddy, retractable cord wrap and large rear wheels make the EX30 very easy to transport. For maintenance, it doesnt get any easier than the EX30 pallet design. Simply open the hinged tanks for full access to all internal components on the machine. But it is the Easy Transport features of the EX30 that crown it already as the king of mobility. A special wand caddy is molded into the design of the machine. A retractable hose wrap holds your vacuum and solution hose. Cord wraps hold your electrical cords. It is the easiest high performance extractor in the world to move through a facility. For performance, the EX30 has all the power and versatility you expect a Clarke extractor to have and more! 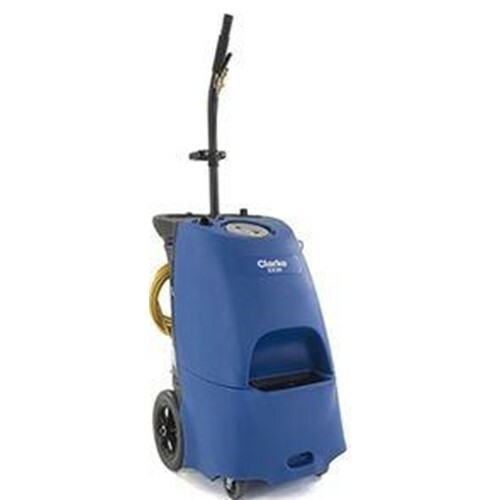 Dual vacuums provide unmatched cleaning power, but dont take our word for it, let the proven performance of the CRI Gold certification speak for the power of the EX30! Roller handles for easy loading. Upright dolly design for easy stair climbing. Wand caddy for easy transport. Low solution filling area for easy filling. Low noise for daytime-quiet operation, with innovative sound deadening chamber. Heater element in-line, after the pump for longer life and is covered by a lifetime warranty. Lightweight, rotationally molded tanks and body with lifetime warranty against cracks, leaks and dents. Industry leading warranty - 2 year parts and labor standard. CRI Certified GOLD third party tested certification for superior cleaning performance for carpet extraction. Dual vacuums with unrestricted airflow for superior water recovery, innovative fresh air intake for each vacuum improves vacuum life, dual 3-stage vacuum motor. Low moisture system - less water combined with higher heat means faster drying, less chance of shrinkage or wicking from the pad.